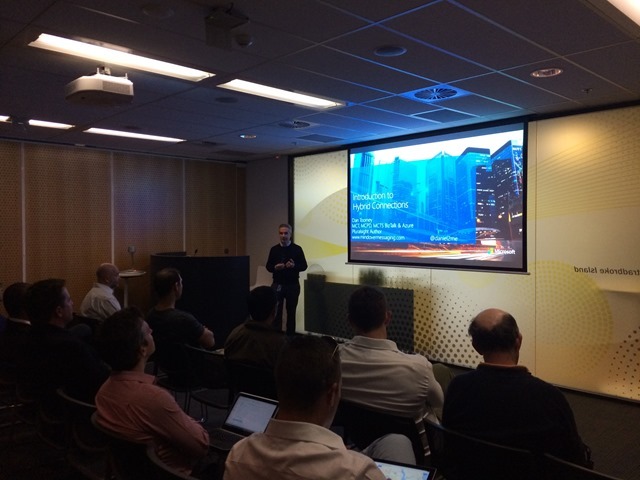 Last week I had the privilege to present on Hybrid Connections at the Brisbane Azure User Group meeting. It was well attended and the community responded very enthusiastically to the ease at which this technology enables you to connect Azure Web Sites and Mobile Services to on-premises resources behind your corporate firewall. One attendee was so excited by the feature that he stayed back after the meeting with his laptop and proceeded to deploy his web site application to Azure right there on the spot, hooking it up in minutes to his on-premises database! I’d like to express my gratitude to Santosh Chandwani, a Microsoft Azure Sr. Program Manager who shared his slide deck with me and gave some very helpful tips in preparing my demo. The slides are available on SlideShare if you wish to view the presentation as I presented it, or you can download the original version that Santosh presented at Tech Ed USA. Q: Seems expensive to get more than 5 HC connections? Q: What are the performance/load specifications? Any guidance on where potential bottlenecks may be, and/or best practice guidelines? A: “In general, the throughput you can achieve with HC is constrained by the internet connectivity between the on-prem network and Azure. Since this is part of the user’s network infrastructure, it is hard for us to provide a specific throughput baseline. Stay tuned for an upcoming webcast about this on the BrizTalk YouTube Channel! UPDATE: Webcast published!! View it here.